So much for the idea that silver is the "poor man's gold." 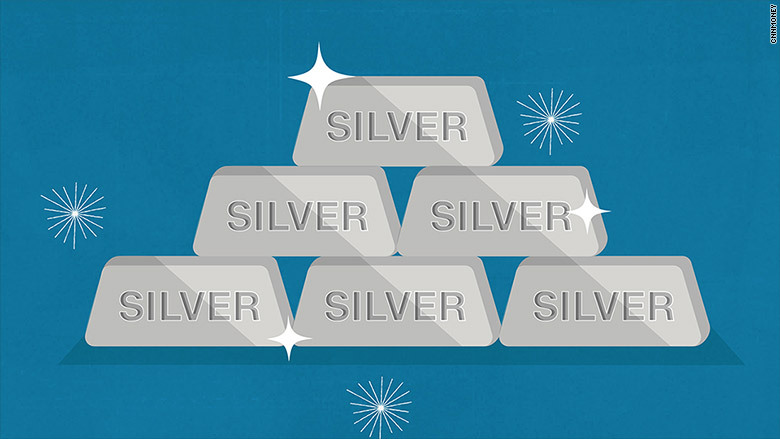 Lately, silver has been on a hot streak -- up 22% so far this year -- making it one of the best investments of 2016. The rally has outshone gold's 18% gain so far this year. On Tuesday, silver shot up 4.5% to its highest level in 11 months. The price of silver has always been just a fraction of gold's, but precious metal experts have pointed out for weeks -- if not months -- that silver has been trading a real bargain. "The silver price looked very cheap," says Dan Denbow, who manages the USAA Precious Metals and Minerals Fund. Investors watch the price differential between gold and silver closely. Typically, gold trades at a 60 to 1 ratio above silver. Recently, it was really out of whack, with the ratio climbing over 80 to 1. The silver spike Tuesday is helping correct that gap somewhat -- call it the "silver catch up rally" -- but there's still a ways to go. Another factor possibly causing silver to bounce is China. Now that China's economy seems to be stabilizing, the expectation is that silver demand will pick up again. "Silver is so different than gold. It has more industrial applications, so it's driven more by industrial demand," says Philip Diehl, a former head of the United States Mint and current president of U.S. Money Reserve, which sells precious metals. Demand for silver is driven partly by manufacturers, partly by jewelry and partly by investors. Owning silver and gold as an investment is all about protecting your wealth in the worst case scenario. "The more pessimistic you are about the world, the more gold you should have," says Diehl. But it's notable that silver is spiking at a time when the stock market has been on a major upswing. After a rocky start to the year, the Dow and S&P 500 indexes are back near their all-time highs. The traditional fear buyers could be coming from other parts of the world. Japan and Europe are living with negative interest rates and ongoing concerns about deflation. Gold and silver offer those investors protection. "Uncertainty on monetary policy and interest rates has spurred interest back into precious metals," says Andrew Chanin, CEO of PureFunds, which runs the PureFunds ISE Junior Silver ETF (SILJ). It is up over 130% this year. "We're seeing what looks like strong demand from the coin side as well," notes Chanin. Silver is now worth about $17 an ounce. Gold is trading at $1,254 an ounce. Not everyone is convinced silver is a great investment right now though. "Silver peaked in 2011. It's only gone down since," says Wells Fargo commodities expert John LaForge. "I don't see anything saying, oh, the fundamentals are changing."